CherokeeForum.com has a lot of great information. Sometimes the best way to get at that information is through a good search. Here are some steps in order to make an effective search. Basically you have two types of Search, a Quick Search and an Advanced Search. If you want to do a quick Search you can just click the word Search in the header bar and then enter the word or words that you want to search on and then press the 'Go' button. An Advanced Search though can be a great way to find the information you need. You click on the word Search in the header bar then click on the 'Advanced Search' link which is under the Search box. This will take you to the Advanced Search screen where you can enter more specific criteria on what you would like to search on. You can search by a lot of different criteria with an advanced search. 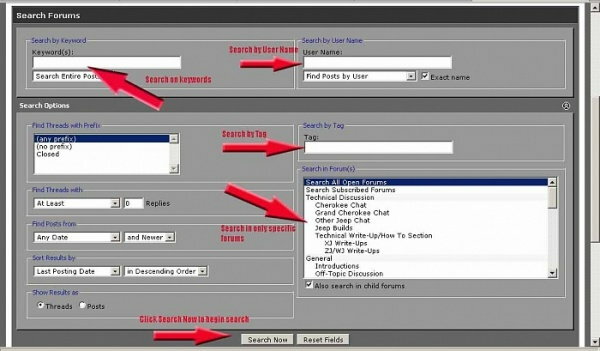 Some of the popular criteria are Key Words, user name, tags, or search in a specific forum. Sometimes it's difficult to find relevant search results, due to the fact that some words are "either very common, too long, or too short and were not included in your search". For example: search for TPS adjustment, and you'll only get results for "adjustment", because TPS is too short. Quotation marks are optional, but will give you more exact results. Try it with them or without them, and see the difference yourself.